I’m a weirdo, but I actually enjoy cleaning. It’s a nice way to “take a break” from working or a loud toddler. She likes to clean too though, so quite often I’ll hand her a rag and her mini mop and she’ll go to town! That girl sure is thorough! Even the walls get done regularly with her around. 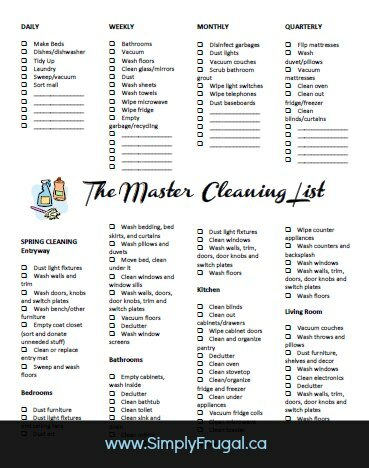 Anyways, I had fun creating a Master Cleaning List that I intend on putting to use in our own home, but thought you might like it too! The top portion includes daily, weekly, monthly and quarterly cleaning suggestions. The bottom portion is a spring cleaning list! Once Spring hits, I’m planning a bit of a challenge that hopefully many of you will want to join with me on that uses the spring cleaning tasks! 🙂 I’ll have more details once the time draws nearer. Download your free Master Cleaning List here. Thanks for the cleaning list! I think it will be really helpful!